Viewing topic "HIre to create Custom Patches"
I am looking to hire someone to create a set of Classical, like you would find in a sax quartet, soprano, alto and tenor sax patches designed to be performed on a WX5 attached to my Rack XS. Matt’s, of Patchman, are too jazzy for my needs. Any taker’s? Know anyone? Contact me at . No offense, but I’ve never seen a Motif Rack XF. Do you mean an XS perhaps? I’m new to the Motif’s so I’m not much help on crafting new patches, sorry. I can do wonders on an FS1R, but not the Motif. 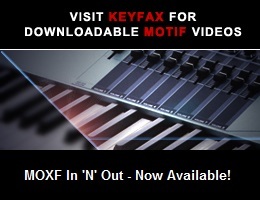 You might try looking in the SOUNDS and the PROGRAMMING and the MOTIF XS RACK forums. I see a couple of threads in there on programming custom voice patches. Is Dave Polich still part of the group? Heck, This is my first time back in about 6 months. So, its been a while for me too!